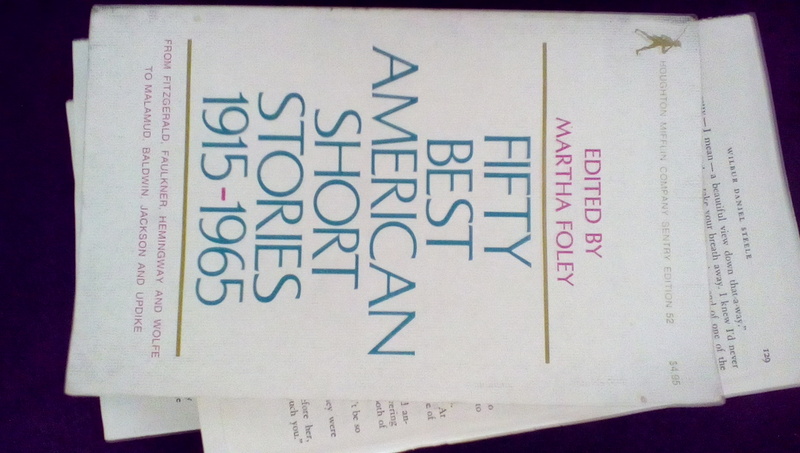 Fifty Best American Short Stories 1915-1965 sits on my bedside table. It’s an unusually heavy book and has burst from its spine, as if weighed down by the importance of the stories and authors contained in its covers. Pages tumble from the book like leaves falling from a tree or perhaps a branch, when a larger chunk of papers breaks apart from the binding. But I have no intention of discarding it. It’s also a reminder of forgotten authors—Elsie Singmaster, Morley Callaghan—along with familiar ones—Ernest Hemingway, John Updike: a symbol of both the transitory and permanent nature of literature. But, most importantly, the book was a gift from my sister Kelly, which she rescued from a used book sale, knowing my love for unusual collections of short stories. It also joined me one summer while traveling along the north shore of Michigan’s Upper Peninsula. It became my literary companion, as dark and somber as the depths of Lake Superior, which were always in view. The collection began to disintegrate during that trip. At night, I’d grasp several pages and read Flannery O’Connor, James Thurber, or Bernard Malamud. I considered scattering pieces of these great stories across the U.P.–John Cheever in Grand Marais, a few pages of Dorothy Parker for Munising, and a smattering of Lionel Trilling in Marquette. And now I wish I had… a souvenir of my reading self everywhere I went, to be picked up by a walker strolling next to a park bench or a waiter bussing a table, creating an endless cycle of reading and sharing, just as Martha Foley intended.